it rain and cash out ! every like is worth money, rain your money over your friends or cash it out! build your followers and post good content, so people will give you more likes! when you reach likes worth more than 100euro, you can have them cashed out! Or show how generous you are and Make your likes Rain on others! Get the likes, make it rain and cash out ! world. A new social media platform from Amsterdam with a revolutionary concept. 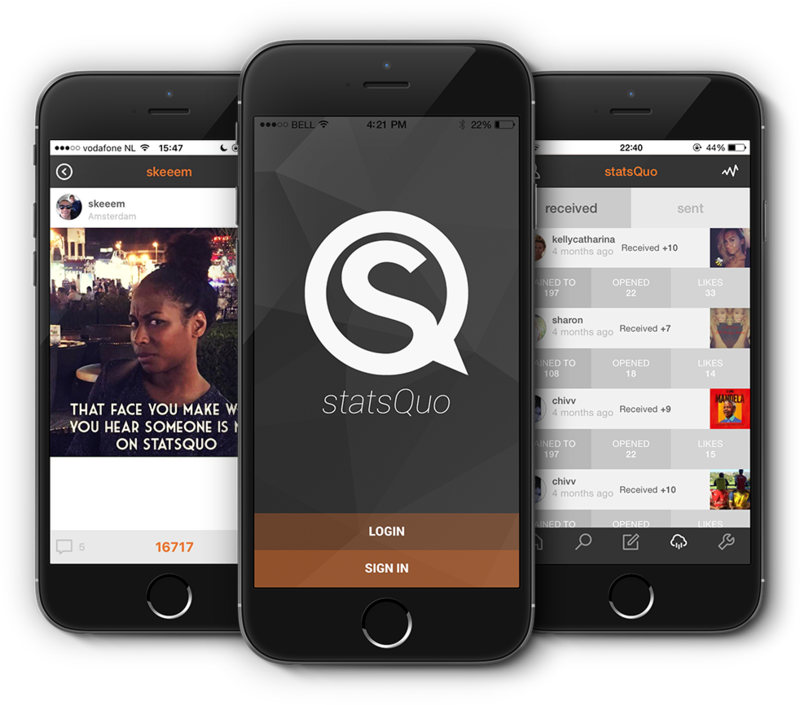 StatsQuo is a social platform where the sharing of 'likes' the main thing. The likes on statsQuo are scarce. This means that a user can only 'like' someone else’s content if he or she has enough 'likes' in his or her possession. But still we say we can do better! Apart from the fact that we’re building a cool community with an even cooler app. What statsQuo doing is the most logical and relevant step for social media of today. It is setting a new standard for social media 2.0. The difference we make is, when someone wants to show a user a specific promotion or message we share the income we make on it with the user. We do this by making sure the promotor gives 'likes' to the user as a compensation for seeing the message. We call this ‘Make It Rain’ as the promotor ’rains’ the ’likes’ on the users. 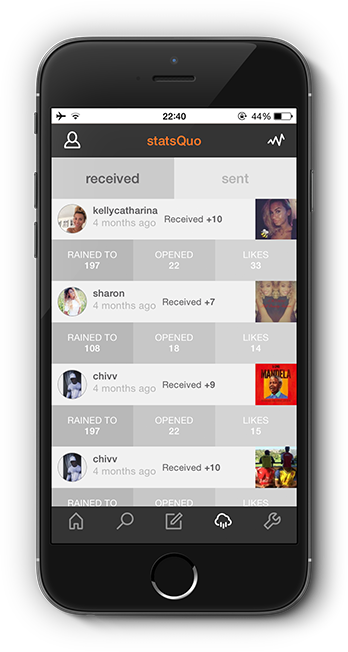 In order for promotors to show their messages to statsQuo users, they need ‘likes’ to ‘Rain’. And before they can do so, they must buy them from statsQuo. Which means that for every ‘like’ a user receives, statsQuo holds a financial compensation and therefore every ‘like’ has a price. The price of the ‘likes’ vary and depend on the income that statsQuo has at any given moment. The actual price of the ‘like’ can be found in real-time in the app at the settings screen. StatsQuo users do not buy likes. Whenever a user registers a statsQuo account and goes through the necessary verification process, they will automatically receive 1000 'likes' for free and sponsored by statsQuo. The more quality content a user shares with the community and the more followers a user acquires, the more likes he or she will be able to get in return for sharing quality content. but if necessary by our own. amount of free 'likes' we provide at sign up for new users. If you like what we’re doing, you are most welcome to join our network by downloading our iOS app. If you are on Android we will hopefully be able to provide you access to our network this year as soon as possible. 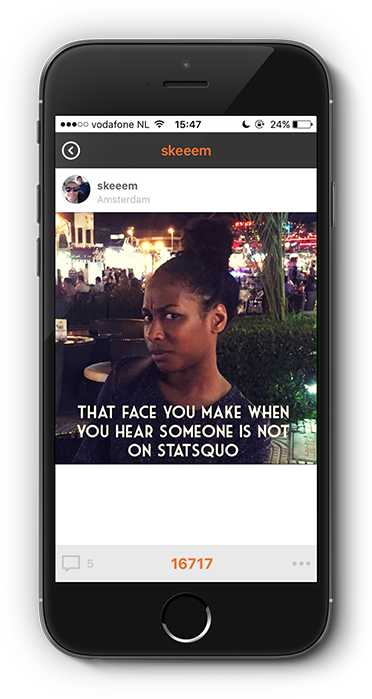 statsQuo is a social networking app that shares its income with the user community in a fun way distributed via the likes. How do I get likes? How can I like something? You like something by pressing the small cloud icon with the heart in it. You can choose to give 1 or 5 or 10 likes for the post. The likes you give away will be deducted from your like balance. Where can I see my likes balance? How can I report or remove a post from my timeline? At the screen of each post you will find an option button. If you press this button, you will see a report function. Press it to report the post and to choose whether you would like to remove the post from the timeline. Where can I find my profile information? Your profile information can be found on the tab at the settings screen. Just press on your the round icon on top of your profile page. What is Make It Rain? Make It Rain is giving away your likes to many people in exchange for them getting a message requesting their attention to view your post. To Make It Rain costs you 1 like per person that you would like to reach. Must I rain all my posts? No. You can choose to just post your content, this way it will appear in the timeline of your followers. Making it Rain is optional, if you Rain a post you can have it seen by many more other people. To whom can I Rain? You can choose to Rain on your followers, the people that follow you, people from your or any other city. Or you can rain to everyone that has a specific hashtag in their profile at the moment in time. How long is my rain valid? You can choose the duration of your Rain while setting up your Rain. You can choose between a few options and the time you select will be the amount of time that users have to react to and open your Rain in order to gain likes from it. What is Rainlock / Pincode? When signing up for a statsQuo account, you are asked to choose a PIN code or a Rain code. This is a 4 digit number that will prevent other people from raining your likes away if they get hold of your phone. Just like the screen lock. What happens if I connect my other social media accounts? You can connect your Facebook account to statsQuo, this will only mean that the content you post on statsQuo will be pushed to your Facebook account. How does statsQuo share its advertisement income? statsQuo shares 90% of its advertisement income with its users and is doing this by having the advertisers buy likes to make it Rain on the community. How does statsQuo share its sponsor income? 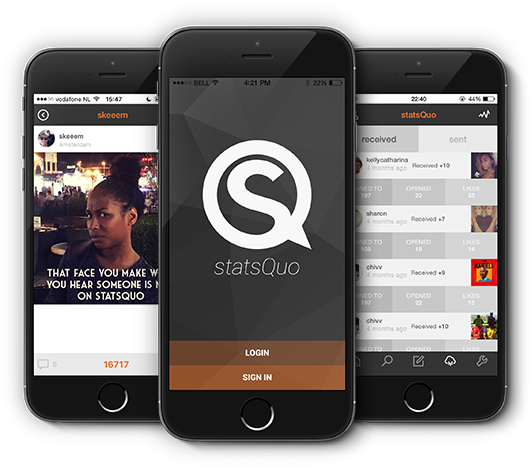 Sponsors can donate any amount of money to statsQuo of which 90% will be added to the value of the like. Users will get a notification if this has happened. How does statsQuo make a living? statsQuo charges advertisers a 10% commission whenever advertisers buy likes in order for them to be able to Make It Rain on the community. How can I have my likes paid out? Whenever you have collected likes worth 100 euro's a cash-out button will appear at the settings screen. Press here to go through the cash-out and verification process. After approval, the money will be transferred into your bank or paypal account. Please send an in App message at the support function, where you ask for your account to be deleted. Please add your email address to the message. You will receive a confirmation mail to confirm. Send us an in app message at the support feature at the settings screen. Please don't forget to mention your email address in order for us to reply to your question.